Situated on the southern tip of Bali, the modern Ibis Styles Bali Benoa Hotel, in Tanjung Benoa, is a welcoming base from which to experience the beauty of Indonesia’s most popular island. With simple yet stylish decor, the hotel has everything you need for a delightful stay in this magnificent paradise destination. Guests can relax by the pool, sipping a refreshing cocktail from the poolside bar while soaking up the Balinese sun, or enjoy the delicious cuisine on offer at the sTREATs Restaurant. 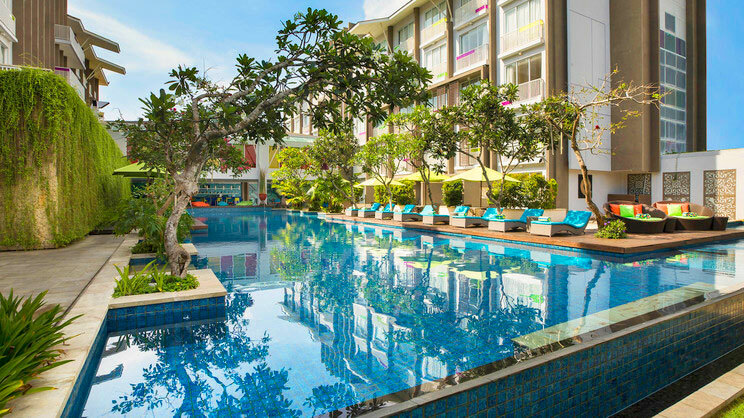 When it comes to exploring the stunning tropical scenery, or discovering Bali’s rich culture, the Ibis Styles Bali Benoa Hotel is perfectly situated close to a variety of elegant mosques, Buddist shrines and Hindu temples. Tanjung Benoa is also a popular water sports area, while visitors can also soak up the sights at one of the many gorgeous, palm-fringed beaches, or experience a high-energy performance showcasing the diverse cultures of Indonesia at the Bali Nusa Dua Theatre. With all these breath-taking attractions nearby, as well as the Ibis Styles Bali Benoa’s brilliant amenities, you’re sure to enjoy a unique tropical getaway. The Ibis Styles Benoa is about a 5-minute walk from the beach. The Ibis Styles Benoa is situated close to a number of restaurants and bars. 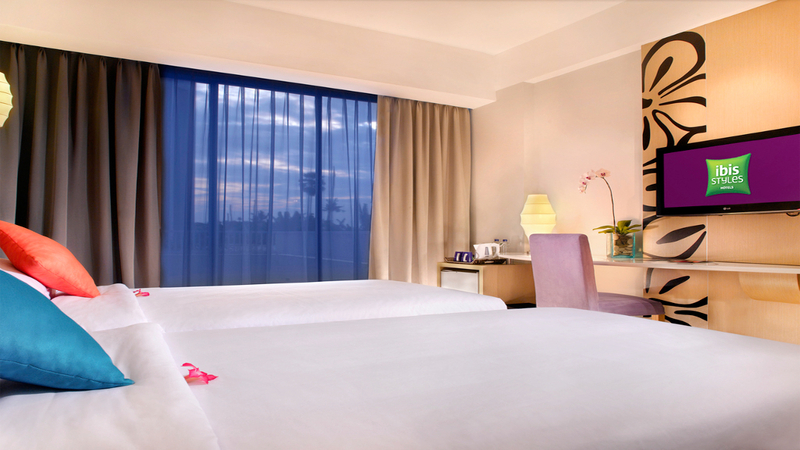 Ngurah Rai International Airport is approximately 13km away from the Ibis Styles Benoa hotel. 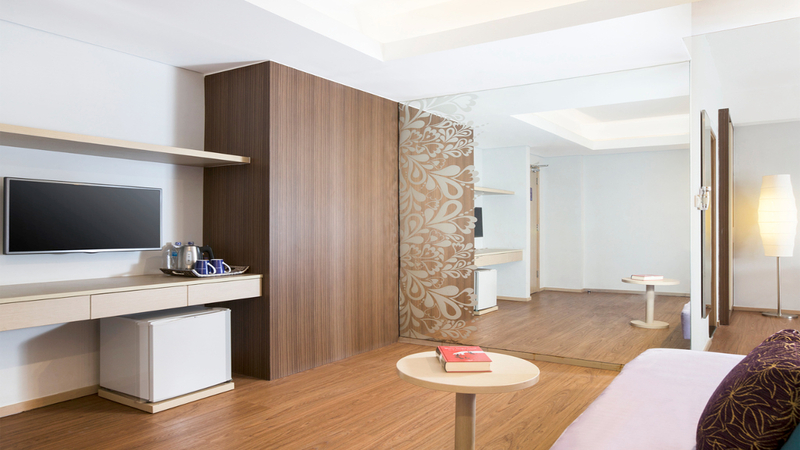 After a busy day experiencing the sights and sound of Bali, guests can recharge their batteries in comfort in the Ibis Styles Bali Benoa’s colourfully-designed Standard Rooms. This type of accommodation is available with or without a balcony and with either twin beds or a queen-size bed. 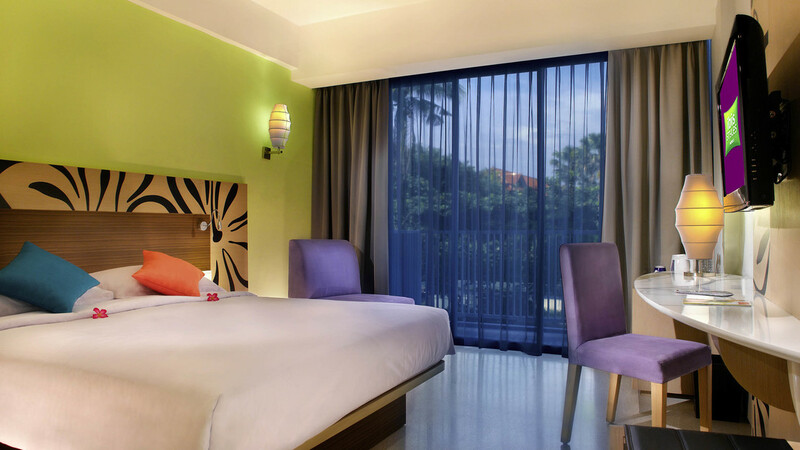 The Ibis Styles Bali Benoa’s modern Junior Suites offer guests a welcoming retreat from the Balinese sun. With a queen-size bed, a balcony and a living room with a sofa, the suites have everything you need for an enjoyable stay on this magnificent island. Serving a delicious selection of Balinese, South East Asian and international dishes, this modern venue offers diners the opportunity to enjoy their meals in the comfort of the stylish surroundings. Situated in the lobby of the Ibis Styles Benoa, the sTREATs Restaurant is open from 6am to 11pm. The sTREATs Poolside Bar is the perfect setting for a snack and a refreshing cocktail while soaking up the Balinese sun. Guests can also enjoy breakfast at the Ibis Styles Benoa, with a selection of Asian and Western dishes to choose from.